Fly-fishing enthusiasts from all over the world have caught the fish of a lifetime in Aspen. From beginners to experts, there's a location waiting for you. Just miles from the heart of Aspen are numerous creeks that flow downstream from their tributaries in the Elk Mountains. These waters provide pristine spots to catch various breeds of fish. Are you a beginner? Don't worry; we’ll connect you with the right people to get you the equipment, lessons, and direction you need before wading into the water. Guided fly-fishing trips are also popular among families and larger groups. Aspen guides know the best spots around town to fish and will gladly direct you to them. You can even customize your guided experience based on expertise so you can be comfortable in the water and fly fish at your own pace. With the mountains surrounding you and the babbling of the current passing by, enjoy the serenity while you fly fish in the Aspen waters. How is fly fishing different from traditional fishing? Fly fishing is a great way to explore the outdoors and catch some of the most unique fish native to Aspen. You may be wondering how fly fishing differs from traditional fishing? Fly fishing is similar to traditional fishing in that a fishing rod is used, but most of the equipment is different from traditional rods and reels. While fly fishing is a lot of fun, it also takes practice. 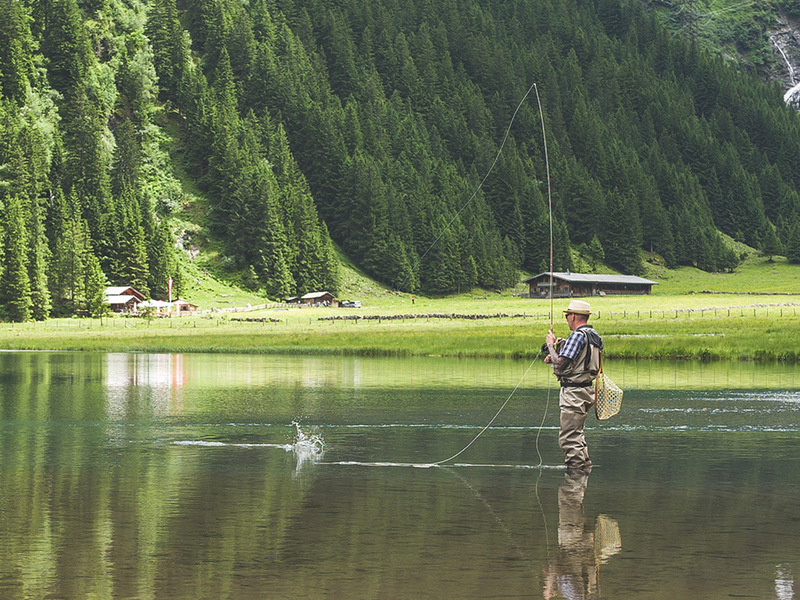 Several fishing expeditions in Aspen offer guides to walk you through the process, but here's what you need to know before setting out on your first fly fishing adventure. The basic equipment you need for fly fishing includes a fly rod and fly reel, fly fishing line, and of course, flies. You'll also need a fly fishing vest for carrying your extra bait and supplies, waders for keeping your clothes dry in the water, and a net for grabbing the fish. Unlike traditional fishing, fly fishing is often done in the water, rather than on the banks or a dock. Nets are also utilized to move the fish from the water to dry land. If you don't have this equipment available, don't worry. Fishing expeditions in Aspen allow you to rent fly fishing equipment, so you don't have to invest extra money in supplies. You may be wondering how the term fly fishing got its name? Simply put, fly fishing is the art of fishing using a fly as bait. Fish rise to the surface of the water to snack on flies and other small insects, so fly fishing bait is a great way to draw them out. Today's fly fishing bait is actually made of synthetic material created to look like real flies, but don't worry, you won't have to handle actual bugs as opposed to traditional fishing baits which mimic small fish, frogs, or worms.